It’s getting warm in these parts. And what better way to cool off than with an amazing popsicle? Did you know there were so many ways to DIY a popsicle? I know my kids are going to love today’s post! Hope you do too! 1. Sour Worms Popsicle. You seriously can’t go wrong with this concoction! Kids will love it! 2. Oreo Cookies and Cream Popsicle. I have one kid who would choose this one every single time. I guarantee it! 3. Coconut Popsicles. These would be a favorite of any coconut lover (my husband!). 4. No more drippy popsicles with this delicious jello recipe. 5. Made purely of fruit, this pineapple, orange, banana popsicle is a super healthy snack! 6. These cherry limeade popsicles are the perfect way to cool off on a summer day! 7. These dole whip popsicles look almost as good as those dole whip drinks at disneyland! 8. Craving chocolate? This chocolate yogurt popsicle is a healthy way to snack! 9. Raspberry Coconut Cream Pops. Oh my these look so amazing! 10. These watermelon popsicles only take a few ingredients and look so delicious! 11. Are you a chocolate and peanut butter fan? If so, this treat is perfect for you! 12. These Orange and Pink Lemonade popsicles look like the perfect combination! What flavors would you combine? 13. Root Beer Float popsicles. Seriously! I think this might even taste better than the actual float and that’s saying something! 14. Banana Nutella popsicle. Looks pretty amazing! 15. This banana ice cream popsicle looks creamy and delicious! 16. For a super easy popsicle, the video below shows a great and easy way to turn yogurt into a frozen treat! Hope you enjoy your popsicles and your summer! « A Father’s Day To Remember! 9 of Our Favorite Ideas! 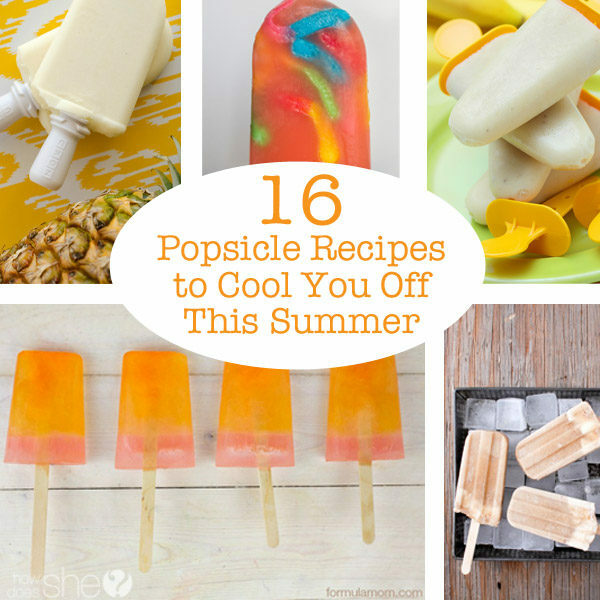 These are mouthwatering ideas.. delicious treats for hot summer! !